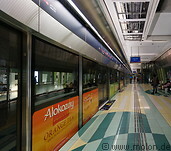 The Dubai metro, a fully automated metro rail network, was inaugurated in 2009. It currently consists of two lines, the red line and the green line, for a total length of 75km. Two new lines are under construction. The Dubai metro is the first metro network in the Arabian peninsula.